Any one who loves to cook or is an amateur in cooking definitely needs a proper measuring set for the kitchen. People generally complain the measuring set available in market get rusted, marking gets washed off, take up too much space. Worry no more. Kaptron brings the perfect solution to this. 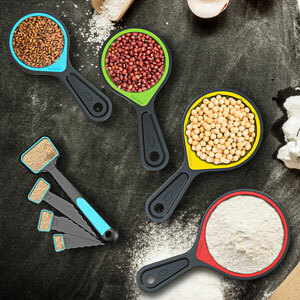 Kaptron's 8 piece Collapsible Measuring Cups and Spoon Set is the answer to all your woes!!!! ✔ Made of premium quality 100% food grade silicone BPA and Toxin Free. ✔ Easy to read engraved markings in both US and metric measurements. ✔ Never gets rust, melt, bend, warp or break as cheap utensils out there. 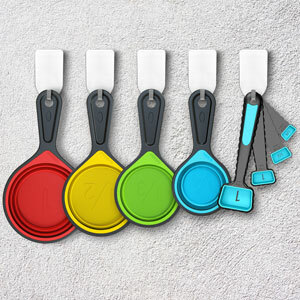 ✔ Removable silicone hanging hook helps keep the cups together but can be removed for individual use..
✔ Measuring cups can be collapsible and neatly stackable for easy and hassle free storage. An ultimate space saver. ✔ A thoughtful design. 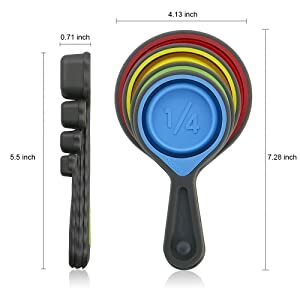 Perfect for your kitchen and great portable travel measuring set for picnics, camping and outside cooking. 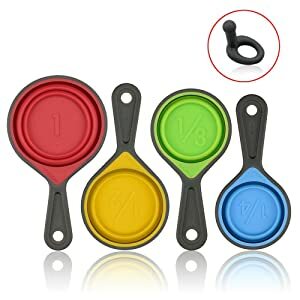 HOW TO USE THE KITCHEN MEASURING CUPS AND SPOONS SET? 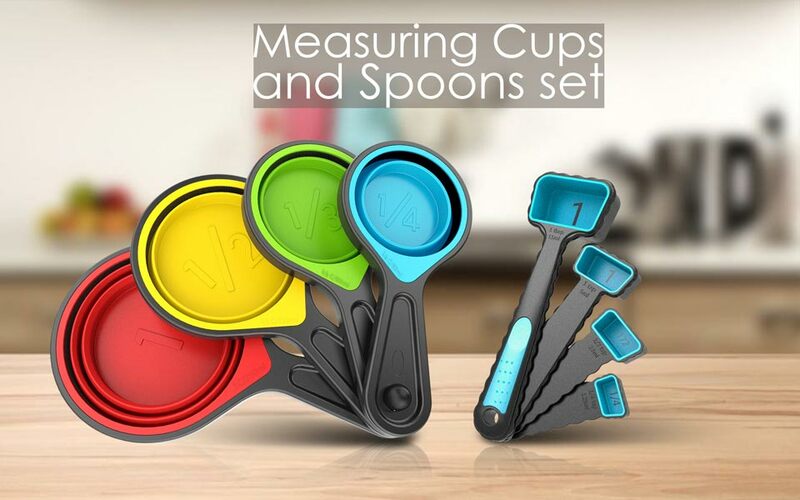 Simply follow the below caring tips to get the best out of your measuring cups and spoons set. ⇒ Rinse thoroughly before the first time use. ⇒ Do not use abrasive detergents or scourers. ⇒ Dry using a soft, dry cloth before storing or using. ⇒ Do not use sharp utensils when preparing or serving food as this may damage the cups. ⇒ Do not place in microwave ovens. Expandable Collapsible Cups and Stacked Swivel Spoons provides you the ability to have a user and space friendly product to find cups in seconds - Effortlessly organize your storage with this fun product. 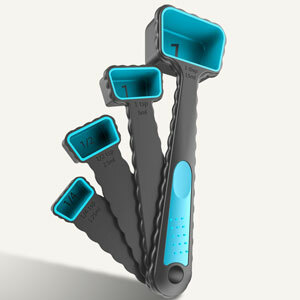 Sleek Design of the measuring spoons allow it to fit any jar easily. So no more fighting with the measuring spoon while measuring ingedients. Spoons swivel into place for easy use when needed. Perfect accuracy during cooking is the keep any chef looks for and our product provides the same. 1 Cup (250ml), 1/2 Cup (125ml), 1/3 Cup (80ml), and 1/4 Cup (60ml). 1 Tablespoon (15ml), 1 Teaspoon (5ml), Teaspoon (2.5ml), Teaspoon (1.25ml).